The sensor “reads” how much light is in the environment, using this value to turn the lights on or off. To control the brightness of the LEDs, Steel connected a light sensor to an Arduino Lilypad controller. The sensor “reads” how much light is in the environment, using this value to turn the LEDs on or off in response. The result is a light show that captures the awe and excitement of Hollywood’s golden age. Pass the Milk Duds, Mr. DeMille; we’re ready for our close-up. This is not original! a student at a fashion school in Los Angeles did this years ago, I am sure I can find a photo. Need the perfect frock for your next movie premiere? Emily Steel's "Little Slide Dress" is positively cinematic. 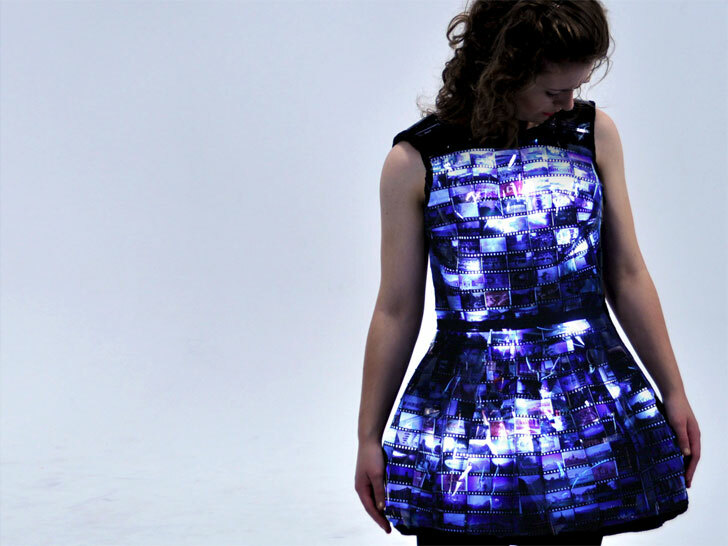 The Victoria University of Wellington student constructed her little black dress using individual film slides, which she backed with light-sensitive LEDs. By day, the dress is a gloss-black number with subtle hints of its true provenance. At night, the LEDs flicker to life, pulsing gently to reveal the captured images.